Today's Draw: Stars in the House of the Ship from the BYO Lenormand from Jera Babylon Rootweaver. Do you feel guided by the hand of God or kindred spirits? Do you perceive them being there sometimes and leaving you to flail at other times? What helps you steer your ship? Before I begin, I'd like to say that every once in a while I say something nice about a deck on my blog. And just for the record, I purchase all these decks myself. I don't get stuff sent to me for free. So when I recommend a deck, there's no ulterior motive. Just my honest appreciation. And I honestly appreciate Jera's Decks. I own both of them and she's working on a third that I'm anxious to buy. This BYO or Build Your Own Lenormand is unique in that you get to choose from five options for each of the 36 cards in the deck, so yours is truly unique. Give it a look, because it's fun to buy and own. So today we have Stars in the House of the Ship. You can see that as some sort of shift or movement happening in the way you receive guidance. Another way of seeing it could be spirit guidance, or guidance that comes from afar. 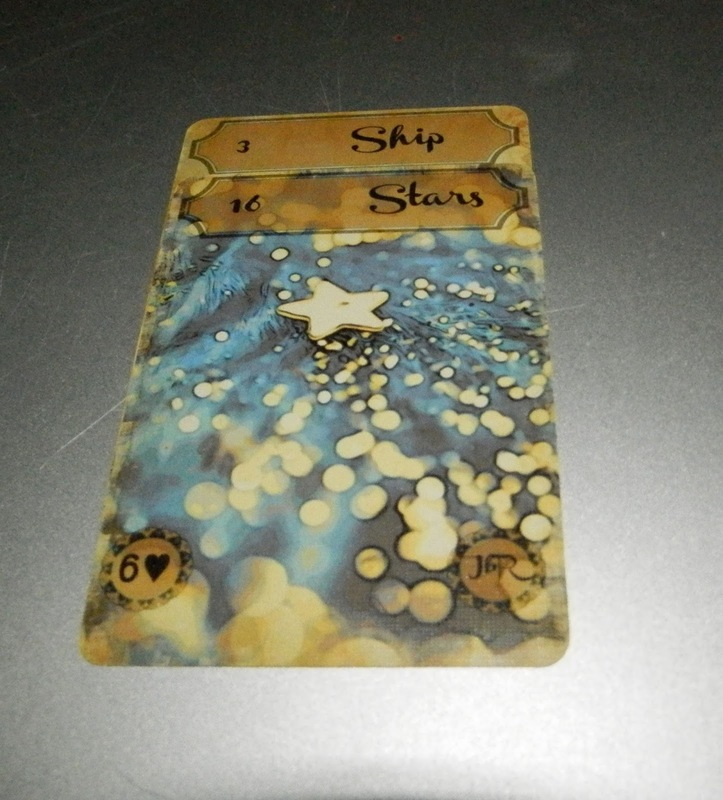 Ships are often navigated by the stars, so to me, both the cards in this pair are hinting at some force that helps guide you on your journey. I've hit a patch of either extra good manifestation energy or luck recently. I can't say which because I'm not sure I manifested all of it consciously, though I know I did do it consciously for some things. Regardless, I feel like I'm in a groove. More importantly, all this good stuff came to show me something quite Zen...there is no good fortune or bad fortune, there is just fortune. So this "extra good patch" I mention is just a perception. Distinguishing between dualities puts us on a rollercoaster ride. To explain what I mean, one of my "lucky breaks" happened when I got pulled over by the police on Saturday. I was doing 38 in a 25, I didn't have current registration, my license plate was askew from having only one screw in it, and I didn't come to a proper stop at a light. I never drive that car, but since my "main car" had no AC, I decided to drive the little car out of the blue. I do believe there's a reason for everything, so the lesson I learned must have been why I drove that car that day. As the officer was listing out one infraction after another, I (rudely) looked up at him and said, "just give me my ticket." So I didn't deserve any breaks. But in the end, he only cited me for the license plate, informing me that if I showed a picture of it fixed to the judge, that he'd probably throw it out. And he reduced my speeding ticket—a ticket that could have been about $150 all by itself—to "failure to obey a street sign," a minor infraction. Everything else he tossed out. So I not only saved about $200, but I didn't get any points against my license. What I realized when I was driving away from the police officer is that, while I think there is a reason for everything, this thinking in terms of "good" and "bad" is something that stands between me and higher guidance, as well as manifestation. Buddhists have a simple word for it—judgment. I'm judging one moment against another to see where I stand with spirit and the universe! That's not exactly the unconditional trust I preach or believe unblocks the channels to manifestation. We get to choose which star we focus on while on our journey through life and whether we choose to be guided by either beneficial forces, or fickle forces that are sometimes beneficial and sometimes seem to abandon us. Really, the only thing that stands between us and a life magically guided and protected from above is us and our need to judge. This post so beautifully describes something I've been trying to put into words! I wrote to a friend yesterday who is sooo into his dualities, and said I don't believe in good and evil. And it's true. It was really good to read such a well-constructed discussion of this, thank you! Thanks! One person once told me it's the "third thing" that encompasses both things. So a person is not ugly or pretty, they're just a person. A situation is not good or bad, it's just a situation. I know that, inside my head, when I qualify things as good or bad, it effects my attitude or approach toward them. So why not be neutral?